Home » WOD Blog » Get Outside! Notes: These Deadlifts are not Touch and Go. Reset Every time and focus on good positioning. Notes: The bar should be set to 55% of your 1RM and the band should add about 20% at the top. These deadlifts should be performed fast. They are not Touch and Go. Ain’t no party, like a PCF Party! Summer is almost here. Time to get outside and enjoy all that Los Angeles and PCF has to offer. 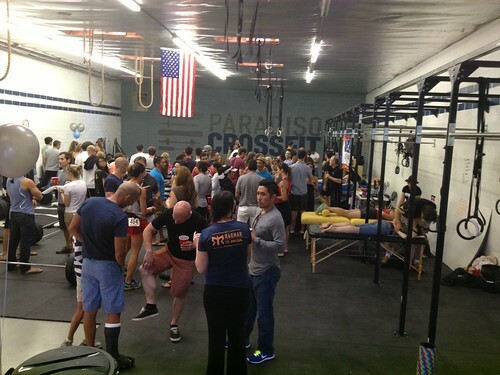 This Summer, Paradiso CrossFit is making a commitment to being more active outdoors and in the community. If you follow along with Gym Members and Friends on Facebook you have probably seen announcements about volleyball, surfing, climbing, etc. These are great ways, especially for the new members, to start creating relationships outside of the box. Surf club meets every Saturday at 8am where Hollister meets the sand in Santa Monica, unless schedule changes occur. Wetsuits and boards can be provided if you are new and want to try the amazing sport of surfing but do not want to invest in buying or renting equipment. There are also opportunities to pay for lessons by local surf instructors if you prefer. There has been a great turn out over the past few weeks and I foresee it growing two-fold. Volleyball will soon be a staple on Saturdays in the afternoon at Mother’s Beach or another court in the Santa Monica/Venice area. Last year we had great turnouts and people brought their friends to tag along. We also were able to grab a couple SUP boards and have a relaxing stroll out of the Marina Harbor. I plan on attending as often as I can and I will be sure to take care of the BBQ, maybe. Many of our members are very active in the outdoors and have been trying to rally people to plan many trips to National Parks in the area; such as, Yosemite, Joshua Tree, Sequoia, and even Big Sur. If you have never seen these majestic places you must! Personally, my favorite places I have ever been to have all been national parks. Most of the members that are involved in the planning for these trips have a ton of experience and can handle themselves in the wild; all experience levels are welcome. Diso and Martina are currently completing their certifications in climbing so they will soon be able to take people with little to no experience out to Joshua Tree and Malibu for a long weekend or day trip and “show them the ropes”. As you should already know, our PCF team has qualified for the regionals which are being held in Del Mar, CA, May 17-19. A large amount of PCFers are going to be attending the weekend event and are either reserving rooms in the area or are going to be car pooling for a one or two of the days. Its going to be fun, exciting, and nerve racking. PCF will have a tent set up for you to hang out and the more support we can give these athletes the better. If you’re on the fence on attending, don’t be. Hop off the fence and decide to come to Del Mar. If you are interested in any of the events above, post a comment of Gym Member’s and Friends and let people know. We have a great community with great people and you’ll be surprised how much your interests are aligned with the other members.